100 years ago, if you were a pedestrian, crossing the street was simple: you walked across it. Today, if there's traffic in the area and you want to follow the law, you need to find a crosswalk. And if there's a traffic light, you need to wait for it to change to green. Fail to do so, and you're committing a crime: jaywalking. In some cities — Los Angeles, for instance — police ticket tens of thousands of pedestrians annually for jaywalking, with fines of up to $250. To most people, this seems part of the basic nature of roads. But it's actually the result of an aggressive, forgotten 1920s campaign led by auto groups and manufacturers that redefined who owned the city street. "In the early days of the automobile, it was drivers' job to avoid you, not your job to avoid them," says Peter Norton, a historian at the University of Virginia and author of Fighting Traffic: The Dawn of the Motor Age in the American City. "But under the new model, streets became a place for cars — and as a pedestrian, it's your fault if you get hit." One of the keys to this shift was the creation of the crime of jaywalking. Here's a history of how that happened. 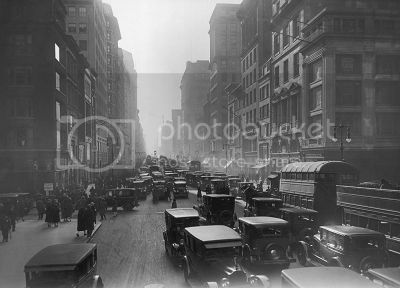 It's strange to imagine now, but prior to the 1920s, city streets looked dramatically different than they do today. 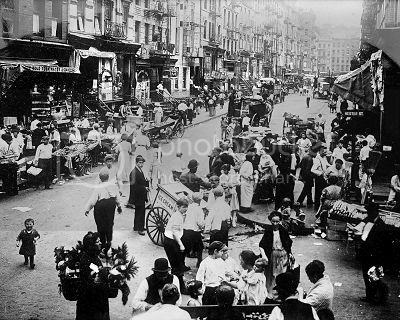 They were considered to be a public space: a place for pedestrians, pushcart vendors, horse-drawn vehicles, streetcars, and children at play. "Pedestrians were walking in the streets anywhere they wanted, whenever they wanted, usually without looking," Norton says. During the 1910s, there were few crosswalks painted on the street, and they were generally ignored by pedestrians. As cars began to spread widely during the 1920s, the consequence of this was predictable: death. Over the first few decades of the century, the number of people killed by cars skyrocketed. Those killed were mostly pedestrians, not drivers, and they were disproportionately the elderly and children, who had previously had free rein to play in the streets. The public response to these deaths, by and large, was outrage. Automobiles were often seen as frivolous playthings, akin to the way we think of yachts today (they were often called "pleasure cars"). And on the streets, they were considered violent intruders. Cities erected prominent memorials for children killed in traffic accidents, and newspapers covered traffic deaths in detail, usually blaming drivers. They also published cartoons demonizing cars, often associating them with the grim reaper. Before formal traffic laws were put in place, judges typically ruled that in any collision, the larger vehicle — that is, the car — was to blame. In most pedestrian deaths, drivers were charged with manslaughter regardless of the circumstances of the accident. As deaths mounted, anti-car activists sought to slow them down. In 1920, Illustrated World wrote "every car should be equipped with a device that would hold the speed down to whatever number of miles stipulated for the city in which its owner lived." The turning point came in 1923, says Norton, when 42,000 Cincinnati residents signed a petition for a ballot initiative that would require all cars to have a governor limiting them to 25 miles per hour. Local auto dealers were terrified, and sprang into action, sending letters to every car owner in the city and taking out advertisements against the measure. The measure failed. It also galvanized auto groups nationwide, showing them that if they weren't proactive, the potential for automobile sales could be minimized. In response, automakers, dealers, and enthusiast groups worked to legally redefine the street — so that pedestrians, rather than cars, would be restricted. The idea that pedestrians shouldn't be permitted to walk wherever they liked had been present as far back as 1912, when Kansas City passed the first ordinance requiring them to cross streets at crosswalks. But in the mid-twenties, auto groups took up the campaign with vigor, passing laws all over the country. Most notably, auto industry groups took control of a series of meetings convened by Herbert Hoover (then Secretary of Commerce) to create a model traffic law that could be used by cities across the country. Due to their influence, the product of those meetings — the 1928 Model Municipal Traffic Ordinance — was largely based off traffic law in Los Angeles, which had enacted strict pedestrian controls in 1925. "The crucial thing it said was that pedestrians would cross only at crosswalks, and only at right angles," Norton says. "Essentially, this is the traffic law that we're still living with today." 1. Which kind of streets do you like better, the one owned by pedestrians or the one owned by cars? Do we need more public space on the streets (walking areas) in Taipei? Which walking streets do you like the best in Taipei? 2. Do you support the events like Taipei Marathon or special street fairs which shut down some roads for the participants? If the government is holding a "No Car's Day", would you support it? Why or why not? 3. Is Taipei a pedestrian-friendly city? 1. Do you sometimes break traffic laws? What did you do? Speeding, jaywalking, running a red light or others? Please share a story of yours with us. 2. (a) If it were 2 am. in the morning, you were riding a scooter, a red light was ahead at the intersection but there was no traffic at all, would you stop? Why or why not? (b) What's your opinion if you found some policemen there trying to catch people who run the red light? Are they loyally doing their job or are they doing something nonsense? 3. What is the thing you hate the most on the road? Can you come up with a new law or new facility to correct it?